The Ondo State governor, Oluwarotimi Akeredolu SAN, on Saturday endorsed President Muhammadu Buhari for a second term in office, ahead of the 2019 elections. Akeredolu disclosed that a campaign office for the President’s reelection bid will soon be opened along Ilesa road, Akure, the state capital. The Governor spoke at a unification rally organized as part of activities marking his administration first year anniversary. The event was attended by All Progressives Congress (APC) governors including, Ogun State Governor, Senator Ibikunle Amosun, Edo State Governor, Godwin Obaseki, former Governor of Ekiti State, Segun Oni, Minister of Solid Minerals Development, Dr Kayode Fayemi, Minister of state for Niger Delta affairs, Prof. Claudius Daramola and National Chairman of the APC, Chief John Odigie-Oyegun. Akeredolu also declared support for Oyegun, describing him as a man who is protecting the truth and integrity of the party. The governor also broke silence on the leadership crisis rocking the state chapter of the party. Akeredolu said Ade Adetimehin remains the authentic chairman of the party in state, adding that any other claim is a counterfeit. He said anyone who wishes to fight should continue, stressing that Adetimehin is the only Chairman of the party recognized by the APC both in the state and national level. The governor said, ” My support for President Muhammadu Buhari is not a tactic support, It is an open support, I am one of those Governors asking that he should come again. “I’m one of those Governors who will give everything it takes for him to remain in office beyond 2019. I have been open and frontal about it, I support the Government. 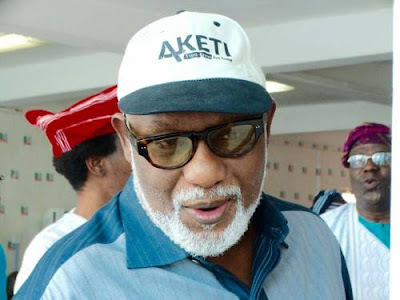 On the absence of some leaders of the party at the rally, Akeredolu said all leaders of the party supported the programme but noted that those who were not in attendance gave reasons for their absence. Akeredolu said he will continue to embark on projects that will take the state from pedestrian politics to a higher level of governance. Oyegun, in his speech, assured the people of the state that the APC led government will continue to bring succor to the masses.